Reflowable e-books adjust to the page makeup of the screen size and the font size selected and are therefore also suitable for viewing on smaller display devices. Reflowable e-books are best generated from structured data. The most common data formats are EPUB (readable e.g. with Apple iBooks, Adobe Digital Editions, or on numerous other dedicated readers) and Mobipocket (Amazon Kindle). To be equipped to handle future updates of e-book data formats however, content should not be saved exclusively in one of the current e-book formats but also in an XML format that is fully compatible with the features and characteristics of the content. This enables questions and answers to be marked up in teaching materials, for instance, and the right answer to be indicated as such in multiple choice questions. This approach makes it possible in future to generate every e-book format that supports user interaction, which would not be possible if the data was configured exclusively on EPUB 2. 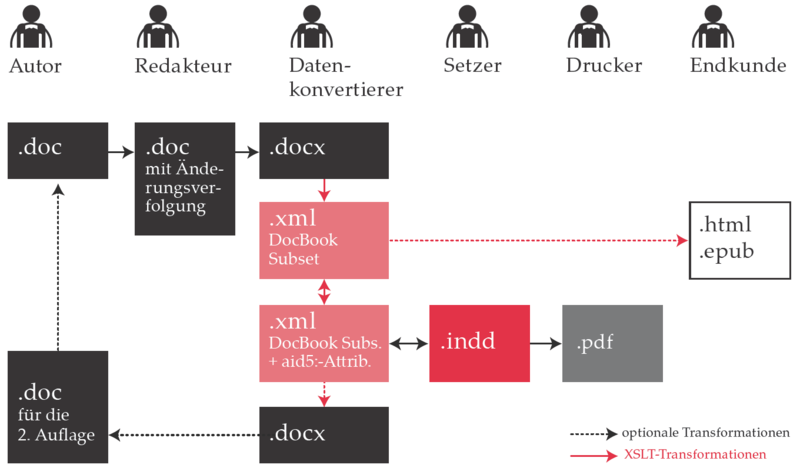 Generation of e-book data from current, structured typesetting data. Conventional page makeup in InDesign, but with particularly careful use of named templates, anchored images, cross-references etc. We can say from many years of experience that, due to shortcomings in the InDesign XML roundtrip workflow for InDesign production, the second alternative is in many cases preferable.